Evil lurks behind every lamp-post in Cage City. But beware, evildoers! The Avian Avenger and his intrepid ward are here to brush away the cobwebs of corruption from the grandfather clock of freedom. And if they don’t find you, the Ninja Turkey will. 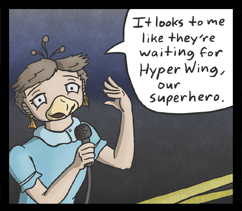 The Hyper Wings is a pet comic project of mine about a team of superheros at work in a city of birds. It’s been around the web in a few different places, but now it has a home of its own. I’ve got about 30 pages from a few years back, so those are running before the new strips, which I promise are much better artistically (see right). Hopefully this will continue to be a regular thing, ie send me an angry email if I’ve stopped updating.